Lucerne is the perfect winter getaway. On one hand, it boasts all of the advantages of a proper city, like cinemas, a classic concert venue, good restaurants and nightlife and some of the country’s best and most popular museums. On the other hand, all of the snowy adventures of the Alps are just a short trip away. This means that there really is no excuse not to visit these snowy, fairy tale-like landscapes. If, however, you’d prefer something a little more daring, you can check out the Titlis glacier or do some winter sports like sledging, skiing and snowboarding at one of the many nearby resorts. 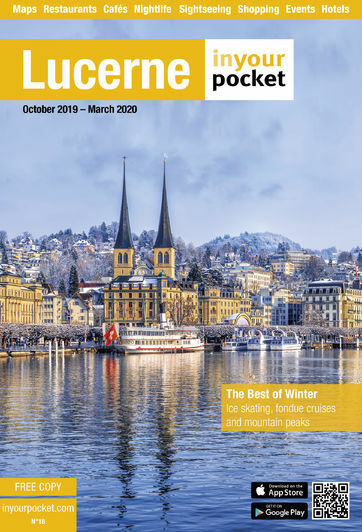 The valley station of the cable car to Lucerne’s very own mountain Pilatus is less than a 15-minute bus ride away and Mount Rigi, which is featured on our cover, can be accessed via a spectacular boat trip and cogwheel railway ride. You’ll find all of these easily accessible mountains and more in our Mountains & Ski resorts chapter. And even the city itself offers some winter pleasures. Taste the Swiss cheese specialities fondue and raclette, which locals usually only eat during the cold season, or go dancing every Saturday night (Nov - March) at the ice-skating disco at the city’s ice rink. There’s plenty to do this winter in and around Lucerne with Lucerne in Your Pocket and we’re pretty sure you’ll agree once you get here. Enjoy!